In its battle to get Italians to make more babies, the Italian government has made an embarrassing misstep. Health minister Beatrice Lorenzin recently announced that Sept. 22 would be the country’s first ”Fertility Day,” when state-sponsored events in Rome, Bologna, Catania and Padova offer the public information about family planning and encourage parenthood. In anticipation of that special day, the ministry launched a #FertilityDay campaign, with 12 promotional images that quickly went viral in all the wrong ways. Several images have a vaguely threatening tone: “Beauty has no age. But fertility does,” reads one, with an image of a stress-smiling woman thrusting an hourglass into the foreground. ”Fertility is a common good,” declares one. ”Male fertility is much more vulnerable than you might think,” reads a third, with a picture of a decaying banana peel. Another image reads, “Young parents. The best way to be creative.” But as many on Twitter have pointed out, Italy’s youth unemployment rate last year was a staggering 42%—which hardly makes creating dependents seem like the best way to be creative. The #FertilityDay campaign includes an online game, which Vice Italia compared to Space Invaders, and a website, from which most content has since been removed. According to the Health Ministry website, #FertilityDay is intended to remind Italians of the danger of falling birthrates, the “beauty” of parenthood, and eventual illnesses that could prevent parenthood. The campaign also seeks to raise awareness of medications available for parents who have not been able to conceive. It’s just one part of Italy’s national plan for fertility (Italian), which also includes financial incentives for parenthood. But for women, a state’s emphasis on maternity can rub the wrong way. Italy has long offered a generous paid maternity leave, but Italian women who work still battle entrenched prejudices that can make motherhood financially precarious. In a phenomenon known as dimissioni in bianco, hundreds of thousands of Italian women have been asked to sign undated letters of resignation, so that employers can fire them without penalty, in case of pregnancy. At the same time, access to abortion is legally guaranteed, but the procedure can be complicated to obtain in practice. What this campaign hides is the complete inability of the government to tackle the declining birth rate and subsequent decrease of cash flow towards the country’s already severely depleted public welfare. If women choose not to have children — for personal or financial reasons, or both — who is going to pay the insane amount of taxes required to keep the system working? Not the children of immigrants, who are not awarded automatic citizenship even if born and raised on Italian soil. It falls to Italian women to repopulate Italy, fulfilling their biological destiny and doing their patriotic duty. 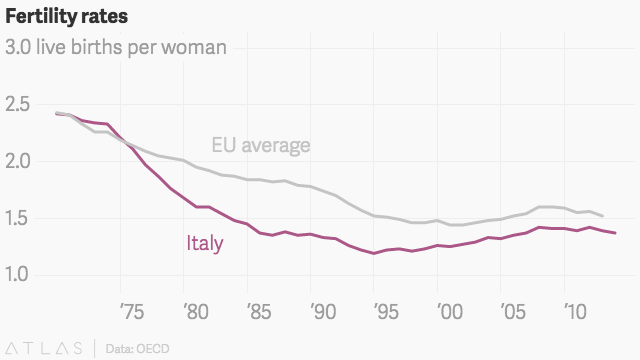 In other words, plenty of Italian women already know that low birthrates are a problem for the current system. They just don’t think it’s their problem to solve.